The various ditches delineating the system of rectangular enclosures across the northern part of the lower terrace are described in Lower Terrace (north), enclosure layout and Figure 8). The Period 2A features occupying the component enclosure interiors (i.e. OAs 6-12) are described below. Period 2A features are relatively sparse across the enclosures. It is highly likely that dense activity of later periods of settlement occupation will have removed and obscured many others, while partial and variable investigation within Excavation Areas D-G will also have affected recognition of some early remains. Despite a relatively large part of the OA6 interior being exposed, the only activity seen is pitting (pits 8013, 9279, 9351, 9535, 9611 Group 75) of the late 1st century BC to the early 1st century AD, evidence of which is scattered across the enclosure. Of these, Pit 9611 lies close to the southern end, its homogeneous sandy silt fill containing by far the largest finds assemblage of the pits of Period 2A in this part of the site. Its upper fills contain Roman pottery and perhaps indicate continued deposition until the mid-1st century AD. 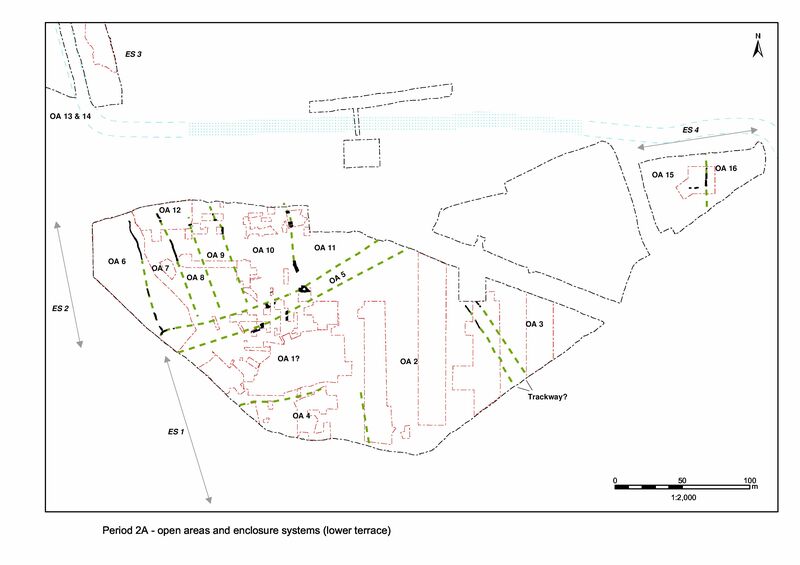 Alternatively, the presence of the later material may be due to the fact that Period 2B enclosure ditch 25020 overlies it and terminates close by. Large pit 9351 contains a relatively complex sequence of fills but no finds of particular note. Pit 8013, located some distance from the others, on the northern boundary of OA6, is possibly a component of the OA12 pitting. Three smaller pits 9356, 9279, 9357 (Group 2085) are cut into the top of 9535 and are tentatively regarded as being of Period 2A date, in the absence of later artefacts in their fills. Short gully 25007 (seg. 9255 Group 2088) underlies a component of the Period 2B enclosure system (ditch 25020). Aligned roughly east-west, it may be deliberately positioned perpendicular to OA6/7 boundary ditch 25024, some 12m to its west. Identified Period 2A pitting (Group 76) within OA7 is confined to two pits located at the very north-western edge of the enclosure. Pit 8001 is cut into the infilled terminal of boundary ditch 25024 and dates from the late 1st century BC to the early 1st century AD. It contains pottery, animal bone and loomweight fragments (SF1519). Pit 9194 lies a short distance to the south. It contains no material other than a single flint blade flake (SF1551) and is sealed by a brickearth deposit (9053) and may be prehistoric. However, it is perhaps significant that the same boundary ditch seems to curve around and actively avoid it, and it is therefore possible that it was a tree hole/throw representing the site of a former tree, rather than a pit. Activity within OA8 comprises only three shallow inter-cutting pits (Group 77) located toward its northern end, alongside the projected course of boundary ditch 25236/25237. Pits 10192 and 10199 are both approximately 1.60m diameter, shallow (a maximum depth of 0.20m) and heavily truncated by Period 2B pits, from which they were distinguished by appearance and by markedly fewer finds. The latest of the three (10108) is larger and oval in plan. All contain small to modest quantities of pottery and daub. Pit 10108 contains pottery sherds in sand-tempered fabric, including jar rims for which a late 1st century BC date is likely. The others include small amounts of grog-tempered pottery, some forms of which are handmade. 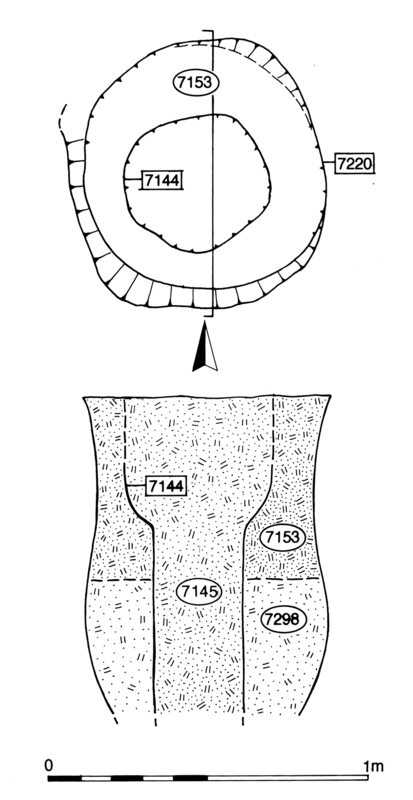 Structure 3 (Group 78) is defined by three undated, closely spaced and similarly proportioned post-holes, 10792, 10794 and 10796, cut into natural gravel and sealed by the earliest Road 1 deposits (Period 2B), within the Excavation Area F 'south trench', and is likely to have functioned in Period 2A. The north-to-south alignment of the structure reflects that of the contemporary enclosure system, perhaps forming part of a longer alignment such as a fence extending north beyond the excavated trench and truncated in antiquity to the south. 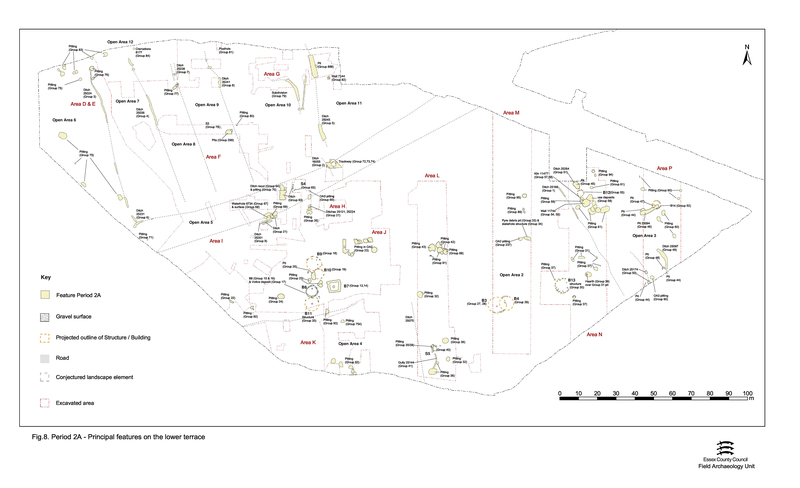 Structure 3 may therefore denote either a modification to the eastern side of OA9 or, more likely, be part of a subdivision within it. Pits 10552 and 10695 (Group 299), alongside Structure 3, were recorded in the field as cutting the earliest Road 1 surface (10685), but are in fact more probably earlier LIA features, filled prior to the construction of Road 1 and which need further consolidation/levelling before replacement (Roman) road surfaces are laid. The infilled slump depressions may have been mistaken for cuts. 10552 is a large sub-rectilinear pit, 3m wide and in excess of 0.65m deep. However, its southern extent was not identified and it remains a possibility that this is, in fact, a ditch terminal. 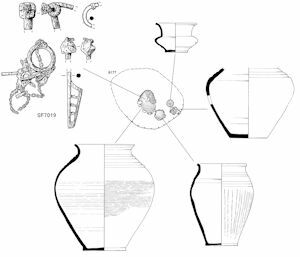 Its fills contain a large amount of LPRIA pottery, particularly the lower, together with loomweight and animal bone fragments. Its upper fills include an iron nail, copper-alloy cosmetic tool and a few sherds of sandy greyware, which suggest the early Roman levelling of an essentially late Iron Age rubbish pit. If a pit, this feature actually lies within the Period 2A landscape in OA9: if a ditch it is perhaps a part of ditch 25241, which constitutes the eastern boundary of that enclosure. Ditches 24043, 25044 (Group 79) may indicate the subdivision of the OA10 interior. The alignment of neither fits within the Period 2A landscape, but Period 2B ditch 25041 (Group 156) definitely post-dates 25044 and probably post-dates 25043. Despite the infilling of both features being dated to the late Iron Age by grog-tempered body-sherds, the ditches themselves may be relict features of greater antiquity (pottery of probable middle Iron Age date was present in 25044). Ditch 25043 (segs 7111, 7674, 7676) is 0.46-0.65m wide and 0.10m deep. It runs on an almost north-south alignment for at least 17m, although neither terminal is extant. Curving ditch 25044 (segs 7198, 7670) is 1.10-1.20m wide and 0.20-0.50m deep. The curvature of this ditch is most marked toward its north end. There is strong circumstantial evidence for ditch 25044 having originally extended further west and having been subsumed within 25041 (Period 2B), which displays a similar curve over its western part. Similarly, it clearly continues southwards into an area where it is masked by later uninvestigated silt deposits. 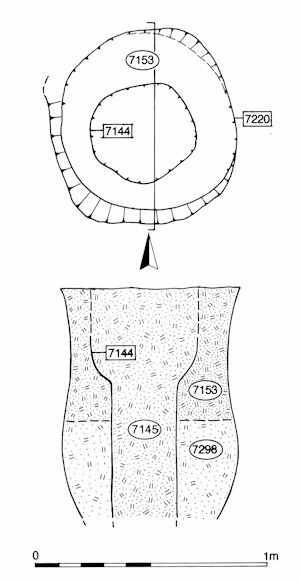 However, an apparent terminal is identified within its length (7670) suggesting that the feature is not fully continuous, and either comprises interrupted ditches or has an entrance gap on the east side of what may amount to an approximately penannular enclosure. Different fills are distinguished along its excavated length; this could be evidence of re-cutting or secondary accumulation within slump hollows related to its undulating base. The only identified pit is located approximately halfway down the west edge of OA10. Pit 10579 (Group 80) is dated to early in the Late Iron Age sequence by the grog-tempered pottery found within it. Isolated post-hole 10105 (Group 81) lies in the north-east corner. While it offers little insights into the nature of land-use within the enclosure, its is notable for containing three body sherds of pottery in both grog- and sand-tempered fabrics, indicating a date early in the Late Iron Age sequence, and a potin coin (SF1507) of a late 1st century BC-early 1st century AD date. The majority of the OA11 interior was not investigated because of flooding. 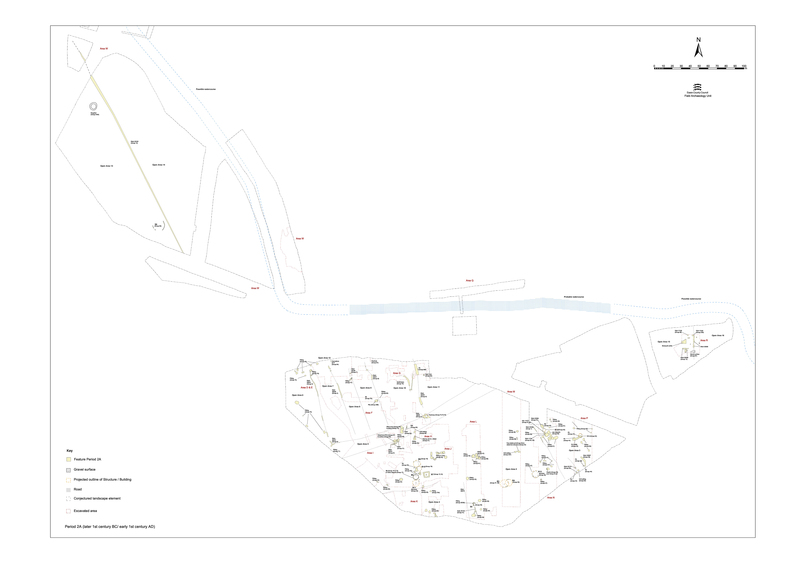 However, that part in Excavation Area G contains a single Period 2A feature - Well 2, feature 7144 (Group 82), a roughly rounded 1.7m-diameter cut lined with a dirty grey deposit of compact clay (7220). Set centrally within this cut is 0.80m square shaft 7144 with near-vertical sides (Figure 23). Due to waterlogging, it was only excavated to a depth of 1.50m below modern ground level. The adverse excavation conditions hindered a full clarification of the feature and it is likely that shaft 7144 penetrated to a greater depth than that recorded in the field. Although no remains of a timber lining were found, one is likely to have been present to retain the clay lining. The finds assemblage is rather small for such a substantial feature, comprising only a modest amount of pottery and a little animal bone, almost all of which is from the shaft fill. This material hints at the disuse and infilling of the well occurring sometime in the first half of the 1st century AD. A virtual absence of material in the lower fill may suggest gradual silting prior to infilling (the slump hollow over this feature, recorded as 7143 (Group 312 Period 2B) contains the majority of the artefacts and includes Romanising pottery, indicating that this feature is infilled and levelled by the mid-1st century AD). Pits 7429 (Group 887, not planned) and 7377 (Group 888) pre-date boundary ditch 25045 (Group 159), which separates OAs 10 and 11. 7337 is dated only by grog-tempered pottery. The exposed part of the OA12 interior within Excavation Areas D and E is predominantly occupied by pitting (8004, 9034, 9060, 9062, 9081, 9097, 9124, 9158) which is noticeably denser than that within the enclosures to the south. The pottery from these pits dates to the late 1st century BC-early 1st century AD, with large quantities of grog-tempered pottery in pit 9034. Sherds of Roman pottery recovered from the top fill of 9124 suggest that this pit continued to accumulate material up to the middle of the 1st century AD, but probably after the main period of its filling. Solitary grave 8177 is the only other identified Period 2A feature in OA12, located to the north-east of the terminal of ditch 25036 (Figure 8 and Figure 25). The poorly defined, oval pit is cut into natural brickearth and contains an urned cremation and three ancillary vessels, all grog-tempered and dating to the Late Iron Age. 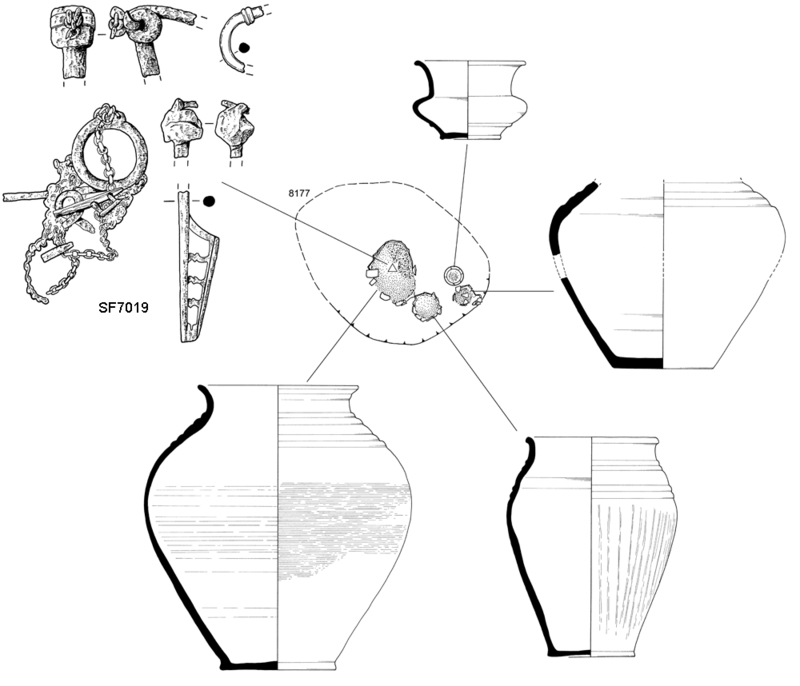 Overlying deposits were stripped by machine and this process had smashed and heavily truncated the main vessel (8169), although it still contained cremated bone in its fill. The three ancillary vessels (8171, 8173 and 8175) lie to its east. These are in good condition, but vessel 8169 is partially burnt both internally and externally. The cinerary urn also contains a fragmentary iron brooch-and-chain ensemble (SF7019) of probable late 1st century BC-early 1st century AD date. It is likely that this metalwork is burnt and that it and at least one of the ancillary vessels were retrieved from the pyre for inclusion in the interment. The further implications of the grave for understanding Late Iron Age funerary practice is explored in Atkinson and Preston (2015, Chapter 7). This seemingly isolated burial was found only after machine removal of an area of the 'reworked' brickearth horizon that occurs along the northern margins of Development Area A1 and hints that other late Iron Age features, possibly including further burials, may have remained undetected. Cremation burial 8177, described above, is only notionally sealed below brickearth. In reality the burial is cut into the natural brickearth which is subsequently disturbed or reworked, so obscuring the upper portion of the grave within a 'dirty' horizon. Silty deposits of apparently reworked brickearth overlay undisturbed brickearth. The agency by which this reworked deposit is created is unclear. However, this vicinity is relatively close to the watercourse and its probably seasonally flooded or boggy environs. It is fairly reasonable to speculate heavy disturbance of the land surface by livestock, perhaps corralled in an enclosure, or else by cultivation practices. However, no diagnostic hoof or ard marks are recorded.